Geoffrey Chatten was born in Gorleston-on-the-sea, Norfolk. He was elected to the Royal Society of British Artists in 1994. 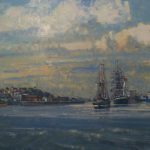 He paints predominantly Seascapes, landscapes and flowers. Geoffrey Chatten has been a member of the Royal Society of British Artists since 1995 and in 2012 won the Geoffrey Vivis Memorial award for his 2012 picture of Dahlias.